The focus of these records is the members of the 'Old Melburnians Society' who served in World War I. The Society was founded in 1879, with the aims and objectives of supporting the Melbourne Grammar School which opened in 1858, only ten years after the establishment of the city of Melbourne. 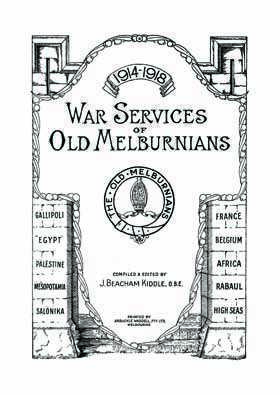 It features details of all 1353 'Old Melburnians' who fought in Gallipoli, Egypt, Palestine, Mesopotamia, Salonkia, France, Belgium, Africa, and Rabaul. * a nominal roll with full names of all Old Melburnians who were on war service. * The 'Our Honoured Dead' list with all 207 men who lost their lives in War Service, together with their full name, cause of death, and date of death. * 'The War Service Particulars' list with details of their war service history. It will also search obituary notices, editorials, a glossary, and letters from those overseas, and approximately 200 portrait photographs. This is a useful genaelogy tool for those with Victorian military ancestry and who are building a family tree. example results finding: A. TAVENER enlisted on 15th November 1916 and embarked as 2nd Lieutenant in reinforcements for 5th Battalion on 19th February 1917. He arrived in France on 5th July and, being promoted to Lieutenant on 28th September 1917, took part in operations there and in Belgium until 2nd September 1918, including the Battles of Broodseinde, Zonnebeke and Passchendaele in October1917, Wytschaete at Christmas and New Year and Defence of Amiens and Hazebrouck in 1918. On 10th April 1918 he was wounded in abdomen and spine and was in hospital until 15th January 1919. He returned to Australian on 31st March and his appointment was terminated on 30th April 1919.